The Yogi and Boo Boo animatronics on stage. Showbiz Pizza was a popular restaurant chain located in America. The chain was founded by Robert L. Brook and the company Creative Engineering in 1980. It was founded in Kansas City, Missouri. 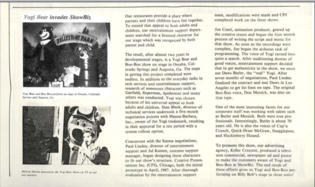 The chain was an arcade/restaurant place, featuring a stage filled with animatronic characters. These characters played in a fictional band called the Rock-Afire Explosion, the fictional band members and animatronics on the stage were usually "Billy Bob Brockali", "Fatz Geronimo", "Mitzi Mozzarella", "Dook LaRue", "Beach Bear", "Rolfe & Earl", "Looney Bird", and many other guest characters. These characters will later be replaced in favor of new ones from the Pizza Time Theater chain, which inevitably replaced the entire brand. In 1992, Showbiz Pizza shut down operations and reopened as Chuck E. Cheese, which is still in operation to this day. 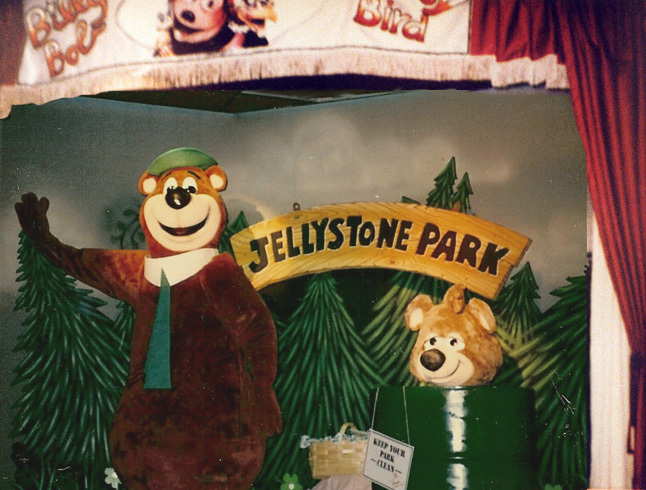 During a time in 1987, Showbiz Pizza was wanting to replace some of the Rock-Afire Explosion characters in favor of some licensed character animatronics. After looking over some options, the most cost appropriate choice was Hanna-Barbera's Yogi Bear (and Boo Boo too). They soon made these animatronics and set them up in three separate locations (Omaha, Nebraska, Colorado Springs, Colorado, and Augusta, Georgia.). The design of the animatronic was done by Jul Kamen and Paul Linden, using the skeleton of the Rolfe animatronic as a base for Yogi. The prototype was soon completed by Creative Presentations Inc. in April of 1987. After the completion of the models, a showtape was produced and written by Showbiz Pizza's entertainment department. Yogi Bear and Boo Boo's in-show voice actors, Daws Butler and Don Messick recorded the lines for the tape. The showtape itself is believed to be completely lost. Nothing is known about the properties and details of the audio for the show in the showtape, or anything about the show itself. All that exist are images of the show set up on stage and background audio for the voice over. All that is known are the voices used. The tape has yet to be resurfaced and is rumored to have been destroyed, as much of the missing Showbiz Pizza tapes have been. Due to lack of documentation, the popularity of the show is unknown, but it is safe to assume it was an utter failure given the fact it was never moved anywhere else besides those three locations they were initially installed at. Aaron Fechter himself said that he doesn’t have any showtapes or audios of the show. From the Entertainment '87 Enterprise Packet. Aaron Fechter claiming to not own any copy of the show tape. Background music from the show.